Leave the A1 motorway at the Mägenwil exit, and drive towards Brunegg/Birr. Follow the signs to the parking at “Landgasthof zu den 3 Sternen”. A free shuttle service will take you from here to the castle, starting one hour prior to each concert. The same service will bring you back to the same place after the concert and will be provided until one hour after the concert, giving you enough time for an apéritif in our festival marquee. Individual cars are not permitted to drive up to the castle. From Zurich main station: Take the S11 train that leaves 1 hour and 1 minute prior each concert and get off at Othmarsingen. A free shuttle service is provided to the castle, starting 1 hour before each concert. From Lenzburg train station: Take the S11 train that leaves 36 minutes prior each concert and get off at Othmarsingen. A free shuttle service is provided to the castle, starting 1 hour before each concert. After the concert our shuttle will return you to Othmarsingen train station in time for you to catch the next train. Please understand that you may have to wait for up to 45 minutes due to SBB timetable and the duration of the concerts. So why not stay at our festival bar and discuss the concert over an aperitif? 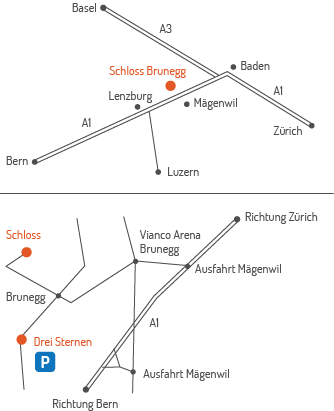 Please check SBB for further options for reaching the centre of Brunegg, from where you can reach the “Landgasthof zu den 3 Sternen” (shuttle) in 3 minutes on foot or enjoy a (relatively steep) 20-minute walk to the castle. Alternatively, you can book a taxi through our partner Aabach Taxi at any time. Aabach Taxi offers festival visitors a special price from Lenzburg railway station to the castle of CHF 40 for 1 to 5 people. Tel. 062 892 24 24.